Carrots (Daucus carota) are the root vegetables of the ‘Umbelliferae’ family, a term derived from the umbrella-like flower cluster on top of the plant. Carrots are usually orange in colour, though purple, red, white, and yellow varieties also exist. These delicious roots are loaded with vitamins, minerals and various other health-benefiting antioxidants. Carrots are helpful in improving vision, aid cardio-vascular well being, prevent and cure certain types of cancers, boost immunity and improve digestion. In addition to this, carrots are also effective in the prevention and cure of various skin ailments. The antioxidants in this vegetable are supposed to treat skin problems like acne, dryness, wrinkles, rashes, dermatitis and other skin conditions. Carrots are loaded with beta carotene that is subsequently converted into vitamin A, an essential nutrient for good vision. Vitamin A is an antioxidant that also protects the skin from sun damage and keeps skin hydrated. This vitamin attacks free radicals to prevent the signs of aging like wrinkles, blemishes, pigmentation and an uneven skin tone. Carrots also contain Vitamin C that aids collagen production in the body. Collagen is a type of protein that is vital for the maintenance of skin elasticity. Further, it helps prevents wrinkles and keeps a check on the process of aging. The anti-inflammatory properties of the nutrient help to revitalize and tone the skin. Topical application of carrot pulp is effective in treating blemishes and adding glow to the skin. You can prepare a moisturizing carrot facial mask at the comfort of your home. For this, grind the grated carrots to a smooth paste. Blend the paste well with milk cream and honey. 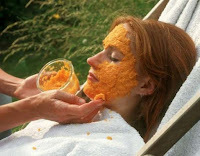 Apply this carrot mask evenly over the skin. Let it sit on face for 15 minutes and wash off with cold water. Carrots are also known to improve hair thickness, combat hair loss and promote growth as they offer vital vitamins to hair, making it stronger. Not just that, vitamin C and E in carrots is said to improve blood circulation in the scalp, thus preventing premature graying of the hair. Now we have many healthy reasons to make carrots a regular part of our diet, and enjoy all the skin, hair and health benefits they have to offer. Whether juiced, raw or cooked, carrots are a wonderfully healthy vegetable! How to Get Fair Skin Naturally: Best Fairness Home Tips! Herbal Remedies for Weight Gain! Calculate Your Ideal Body Weight by Height! How to Heal Acne Fast and Naturally! Drink Coconut water for Healthy Skin and Hair! No information on this blog is intended to diagnose, cure or prevent any health/skin related disorders. This site is intended to be archival in nature. Any home remedy or other self treatment shouldn't be followed without being advised to do so by a dermatologist /health specialist. Herbal Beautyholics invites ‘Guest Bloggers’ to share their articles and posts on the blog related to skin and hair care. You may mail your posts for consideration at garimasancheti@gmail.com. The writing shall be reviewed and if there are (if any) substantive changes, it shall be mailed back to you for consent, before posting on the blog. Thank you! Wish you a Happy and Healthy Living!